My post today is about Christmas book bags. 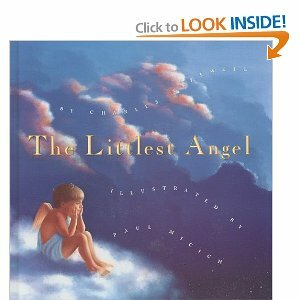 When my kids were little we would read Christmas stories during the Christmas season. I would purchase a new Christmas book each year. My kids aren’t so little any more but we can still read our Christmas favorites. I really like to have my Christmas tree up and decorated the last week of November. What I’m not good at is having presents wrapped and under the tree right away. It takes me a couple of weeks after the tree is up to get gifts wrapped and placed. So I have a pretty Christmas tree sitting there with no presents underneath. A great way to fix this is… Christmas book bags. They look like Christmas presents already wrapped and under the tree. Every one of these fabric bags has a Christmas book or Christmas story (printed off the computer) inside. I made 15 bags with leftover fabric from last Christmas and a few new fabrics from this year. The evenings we decide to read a Christmas story my family will choose a bag from under the tree. You can also do this activity as an advent type countdown and have the bags numbered. I decided not to have “24” bags since I would like to do other type of activities during the week that might not always have time for a story and an activity. But since I love to read, this is very important to me that my family has some Christmas stories that are their favorites to read each year. These book bags are super easy to make!! This fabric is 44-45″ wide. The fabric is folded lengthwise (the fold is shown at the top and the selvage is shown at the bottom). With this one yard of fabric I cut 3 bags at 12″ wide. Only two sides are sewn (the fold is the bottom of the bag). Once the sides are sewn – hem the top of the bag. Once the sides are stitched and the top is hemmed – turn inside out. The ribbon is sewn to the back of the bag with a straight stitch (thanks Sarah). Tie the ribbon around the bag with the bow in the front to help “close” the bag. It only takes about 10-15 minutes to cut and sew one bag. This is easy peasy sewing!!! The bags laid out under the tree – patiently waiting for our family members to choose one to open and read. I have seen some gift wrap books and place under the tree. 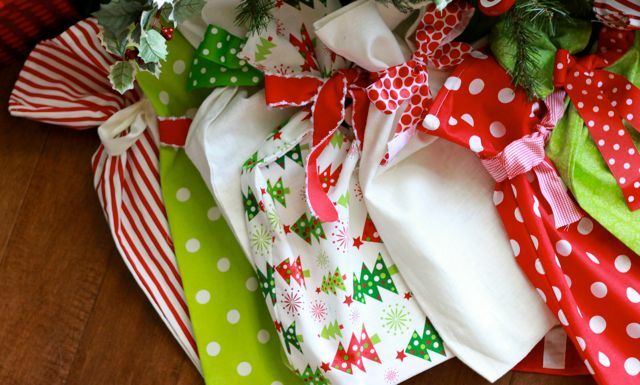 The fabric bags make it super easy – no gift wrapping each and every year, no paper waste and a it’s big time saver! Once the bags are sewn they will be ready to fill with books for each Christmas season. I love that these bags will be coming out every year. Love this idea! We have quite a collection of Christmas books, and I like the surprise element of unwrapping a different book each night. Thanks for sharing. Thanks for this idea! I am now making lots of bags in different sizes, to reduce paper and allow us to re-use them next year! These are so darling I just stumbled upon these! What a brilliant Idea! They are great and recyclable! I am glad you found this post! These are so great! Thanks for the tutorial just in time for Christmas! This is great! I have 3 yr old little and the last 2 yrs we do a book countdown, but the bags would save me from having to wrap 25 books every year. I love this!! My thoughts exactly!! I sewed them with a girlfriend so it was a fun afternoon of sewing. I’ve had the book bags for a few years. It’s so nice to just pull them out and set under the tree. I even leave the Christmas books inside the bags and store them that way. We only read the books at Christmas anyways!